A computer systems administrator is responsible for their given organization's networks. It is a position that requires someone with the ability to troubleshoot and repair network problems quickly since most businesses depend heavily on their network functionality to complete tasks. Therefore, this isn’t a position for someone who may be easily overwhelmed by constantly changing priorities. What is a Computer Systems Administrator? A computer systems administrator maintains an organization’s workflow and keeps its communication lines open for use. An administrator works with stacks of network servers and cables and resolves malfunctions within their company’s computer hardware and software. They also make required updates to all equipment and software for the safety of the company’s network. An administrator ensures proper functionality of email and data storage networks and connectivity of employee workstations to the central computer network. They also have to train new users to use relevant software and hardware. In special cases, an administrator may also have to manage telecommunication networks to connect employees outside the office. Adaptability is key. Network technology is constantly changing. Therefore, it is vital that administrators stay up-to-date with the latest standards and developments. For this reason, many take courses throughout their careers to stay in the know. Determines the causes of errors and take the steps needed to fix those errors. Identifies key services such as DNS, DHCP, and firewalls. Remains up-to-date on current technology changes and trends. Monitors and answers questions related to the computer system. Issues upgrades to the computer system accordingly to meet the needs of the company. Understands how information flows and the basics of network technology. In order to become a computer systems administrator, you will need a bachelor’s degree in either computer or information science. Sometimes a degree in computer or electrical engineering is accepted by employers. In addition to a relevant degree, training and coursework experience in a programming language, networking systems and/or design is helpful but not necessary. Certifications are a great way to make your resume stand out compared to other candidates. Certifications keep you (and your knowledge) relevant and recent. One can join a professional organization like the Association for Computing Machinery to gain the experience required to become a computer system administrator. The ACM offers online courses in various topics such as C++, cloud computing, Linux network management, and much more. There are certification programs run by Microsoft, Cisco, and Red Hat. These certifications are typically required by businesses for a computer systems administrator to hold in order to be considered for the position. According to US News and World Reports, the median salary for a computer systems administrator is $77,810 as of late 2015. They’ve also ranked computer systems administration in their 100 Best Jobs ranking. Overall, growth in this role is not as rapid as other comparable computer information science positions. But the US Bureau of Labor Statistics still expects 12% growth in this career—comparable to other occupations in the US. 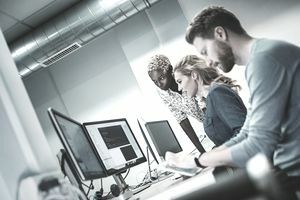 Constantly changing priorities, and keeping up-to-date with rapidly changing technologies can seem exhausting for some people, but businesses still need computer systems administrators. All necessary communication nowadays wouldn’t be able to take place without a computer systems administrator, and that fact alone makes that person the most important employee in the entire company.